The past week – one that included a birthday celebration and Thanksgiving – and included what would pass as ‘normal’ eating for the average person – proves the assertion that I am kept artificially thin against my body’s will through a low carb diet. On Thursday I was 197. Today, just 2 days later, I am 205. The ability to gain 8 pounds in 2 days is a remarkable feat, and has to do with my body thinking that my weight is far to low for its comfort. In reality, my body decided long ago that I should be at least 250 pounds and while I have kept it from that number for many years now, my body has never been in agreement with me on this, and the past two days – when I have given it the opportunity through providing it what would be considered a ‘normal’ amount of daily carbohydrates (300 grams per day), it has taken the opportunity to go for the gusto and start to rebuild my fat stores back to what it deems appropriate. My body and I will never see eye-to-eye on this. And to prevent my body from following the course it is most content with, I will need to maintain a low carb diet for the rest of my life. I have known this for many years now – I can just point to the past 2 days as to a concrete example as to why I believe this is true. If I am good moving forward, it will take 3 to 5 days to get back to that 197. The weight that comes on fast can usually be shed fast by the simple application of low carb ketogenic dieting without starving. Letting it hang around seems to give it time to ‘get comfortable’, which makes it a hell of a lot harder to be rid of. I predict I’ll be back to 197 by Wednesday. I must say the eating was fun, though. 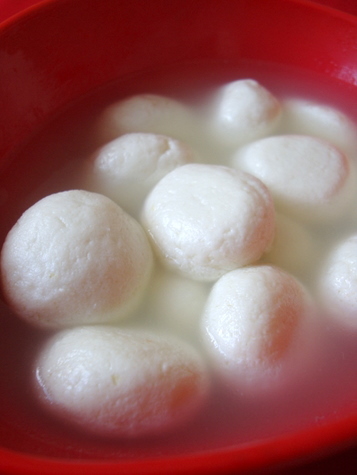 I had an Indian friend over for Thankgiving and he brought 2 wonderful home made Hindi dishes as well as an Indian dessert called rasgulla, an Indian dumpling roughly equivalent to cottage cheese and flour, cooked in a sugar syrup until the sugar is infused into the dumpling and the carb count skyrockets. I love trying new foods from different cultures and couldn’t pass this up – high carb or no. Despite the scale’s reaction to this indiscretion, I highly recommend the occasional diet vacation. It helps you to stay sane. Likely, at least three pounds of the added weight consists of glycogen and the water associated with the storage of same. I agree with the ‘eat anything once a week’ rule as a long-term strategy, though I find making this an actual ‘scheduled’ event hard. Instead, I like to build in unscheduled mishaps that more or less add up to a couple of overfeeding a month. You’re probably right as well that much of this is water weight, but some is good ‘ol fat, and the longer it sticks around, the longer it will take to come off. The Indian food was great, though – no regrets. My friend did mention that almost all the people who live in the region where the dishes he brought came from all have diabetes. Are you combining your diet changes with exercise? Best of luck. You know Jean, everything I have been reading shows exercise to be an AWFUL means of weight loss. Its health benefits are without question – but as a means to control weight? Not so much. You have to exercise a LOT to get any weight loss benefits, though even small amounts of exercise have health benefits. Your experience sounds like me. I have to be supremely faithful or else. I have recently discovered stevia, though, and that is helping me stay the course with the occasional low-sugar dessert! I love trying new foods from different cultures – I couldn’t pass it up. No remorse – I’ll just have to take the weight off again – no big deal. I had missed this post. My own blog post had your comments regarding body memory and the body wanting a certain weight (higher) and you wanting a certain weight (lower). The weight stalls reflect the different levels we reach as we lose weight. The body refuses to budge when we attempt to go lower than a (body) remembered weight. This stall of mine has lasted over 12 months now. No gain/ no loss. A victory of sorts. Thanksgiving is a FOOD holiday. No gifts, no tree, no lights. Just food and lots of it. Perhaps the best meal we ever eat. So, very difficult to navigate. Add a birthday, which YOU also associate with food, and it makes sense you had problems. I associate birthdays with sadness, not food. My family always forgot my birthday. I tried making low carb subs for higher carb Thanksgiving foods. A 80% failure. I think I work best by just not eating things that cannot be made low carb. In any event, the waistband of these pants I have on is too snug so I will be joining you in going back to the basics of low carb. I don’t have a scale that works so I go by my clothing. Snug is too much of something and loose is just right. My own experience, as an overweight diabetic brought me to read Bernstein’s Diabetic Solution. Dr. B, who is also a diabetic recommends a strict low carb diet. He, himself, has gone completely off fruit, which I find hard to do. He says vegetables have everything fruit has, except sugar. I dropped from 249 lbs to 200 and plateaued, unable to drop below that weight until last August when I reached 199. Now, I am up to 202 again. Then I realized that I had let my tablespoonful of blueberries grow to half a cup or more.